Neil Gaiman's Journal: How well do we use our freedom to choose the illusions we create? Hi, Web Goblin here. I will be guest-blogging for Mr. G as needed over the next four weeks while he's in China. I presume this will be intercepted and read by the guest bloggers, as Neil is apparently going to China to achieve (more) enlightenment at the Shau-lin monestary, or something. I may have missed a point or two. "Ask Neil" still goes to Neil and Neil alone. If you want to contact me (the web goblin) you have to use the Site Inquiry form. Make the "post by" title at the TOP of the entry rather than at the bottom, and make it a bit higher contrast. That way, at the beginning of the post, we know who's talking. This isn't a problem when 98% of the posts are by Neil, but now that there's going to be a smorgasbord of posters, I'd probably help a lot to know at the beginning to know who was posting. So if Lorraine posted, for instance, talking about "her Dad" we'd know that it was someone other than Neil that was the subject. The other thing is it would be cool to get a brief introduction to the players by name. Obviously you shouldn't post your name and address, or even real names. And Maddy, Holly, and Lorraine wouldn't need intros. But who's "Dan Guy"? Is he the same as "Web Goblin"? Just a single sentence, as deep as a playbook character introduction. Such as "I'm Jane, the person at Blogger who's responsible for rooting out all the annoying single-instance tags that Neil puts in his posts, bless him". Neil :: The man, the myth, the legend. The man needs no introduction, obviously, but what about the latter two? I have some theories. 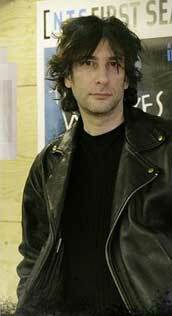 To the left, Neil Gaiman. Neil sang and played bass in a punk band in 1977. He is suspected of having an army of clones. To the right, Gary Lightbody. Gary is the lead singer/lyricist of Snow Patrol. He was "born" in 1977. Warren Ellis hates Snow Patrol. Warren Ellis hates clones. 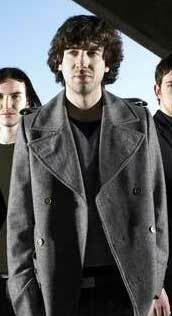 Is Gary Lightbody one of Neil's clones? The evidence seems incontrovertible. Lorraine :: The Fabulous Lorraine is Neil's assistant. Her past is shrouded in mystery. Some histories claim that she was born among a roving band of fiddling Roma-Australian (or Romaustralian) pirates and then left them to wander the Songshan mountains in search of the legendary Shaolin Warrior Assistant monks. Upon finding them she survived the Ten Trials of the Personal Assistant, the very least of which is opening a box full of sand without spilling a single grain on the carpet, and so was granted entry. After a decade spent training in seclusion she re-emerged, appearing no older than the day she had entered, and voyaged to America in search of a master worthy of her skills. Other histories claim that the newborn Lorraine was left at the gates of those Shaolin Warrior Assistant monks and was taken in by them and raised in their ways, learning to decipher a travel itinerary before she could talk and mastering the secret art of meat explosion before she could walk. On the day when she turned eighteen, having attained the level of "Fabulous" through her training, she departed the monastery in search of further challenges. Travelling West, she allowed herself to be captured by wandering Romaustralian fiddler pirates in order to learn their fiddling ways. Within a month she challenged their leader for supremacy, killed him with an explosive Chicken Cordon Bleu, and was crowned their Queen. Sadly, her fiddling prowess was soon so exemplary that word spread far and wide and other Romaustralian fiddler pirate Queens began arriving to challenge her, each invoking their right to Suzuki-at-Sunrise, a duel to the death. Rather than be forced to bloody her bow, the Fabulous Lorraine abdicated her crown and sailed to the new world in search of a master worthy of her varied talents. Which is the true story? It hardly seems to matter. Web Elf :: The Web Elf was once the webmistress of Mr. G's site, before her retirement. She was eventually outed as Olga Nunes. You can see pictures of her and everything. This is sad on one hand, because the Web Elf and the Web Goblin had all of these plans involving wearing masks and going incognito, but on the other hand what musician doesn't need a little free publicity? The Web Elf is brave and kind and did we mention brave? She is currently traveling the world, either following her muse or bringing her own muse to others. Web Goblin :: Hi. I'm the Web Goblin, aka Dan Guy. I took over when the Web Elf retired over a year ago. I wrote a bio over at the Neverwear store that pretty much covers it, I think. In Taipei airport there were toilets for men, women, enormous telephones, daleks and people feeding giant venus flytraps.